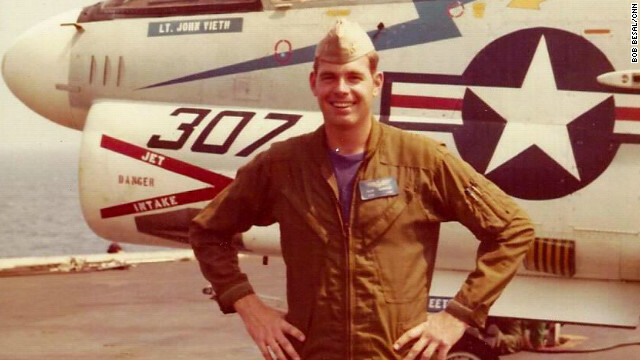 (CNN) -- Former naval aviator Bob Besal was just 24 when his life literally took a dive. Besal was piloting a Vought A-7C on a training mission 20 miles east of St. Augustine, Florida, more than 37 years ago when his light attack aircraft collided with another plane at 15,000 feet, sending his jet spiraling into the Atlantic. Besal ejected safely from the cockpit; his plane sank to the bottom of the ocean. The other plane limped back to base. This month, Besal's past caught up with the present as divers found his wreckage, and the story can now be written about the people who recently found it and Besal's reaction. fholbert you're claiming that the pilot pictured is Bob Besal, But the aircraft behind him says "Lt. John Tieth". I hope for your sake that you've got a good explanation for this. It's been explained many times that you do not necessarily get the aircraft with your name on it. Just whatever's available. I'm assuming this picture is like football picture day...everyone takes a picture in front on one helmet but the photographer is not going to set up everyone's helmet so you get your picture in front of whosever they pick first. B.S. I think @fholbert photoshopped this or something. I wouldn't put it past him. I want JC to investigate this. I think he's being facetious. Well, I was willing to let this go with blaming @fholbert for this entire scandal, but now that I can see the rest of you are in on it with him, I think the investigation needs to be expanded. One time I took a picture with a Ferrari in the background. That makes it my Ferrari, right? So you mean to tell me Qutch is a living, breathing human that makes jokes?! You got to paint your name on the side first. Why is he wearing his cover at sea? Story is even cooler in that he spent his entire career in the Navy and retired as a Rear Admiral. More proof of what I'm saying. fholbert must of photoshopped this. No way this could have happened like he's claiming. Interesting story! Love the A-7! !